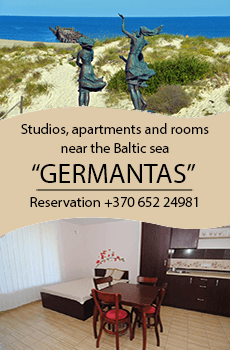 We offer a cozy vacation place in Šventoji, just 350 meters to the perfect wide sandy beach. 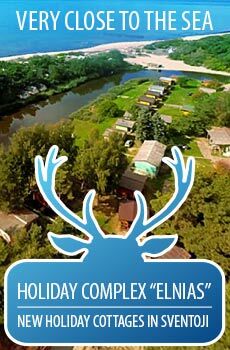 The private enclosed territory of the campsite has a perfect environment with trees and lawn, outdoor furniture, barbecue places. We offer a free car parking, wireless internet (Wi-Fi) for our guests. Low season rates are negotiable. We offer different kind of property for rent for your comfortable vacation at an affordable price. First floor - living room with a kitchenette, shower, toilet, TV, balcony with furniture. 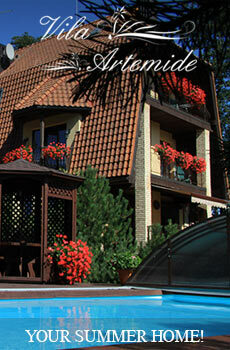 High season price - 65-75 EUR per apartment per night. Double cabins with all the amenities and TV. High season price 40 EUR per cabin per night. Cabins with toilet and cold water, with a double bed and a double sleeping armchair. Free access to a shared kitchen and a shower. High season price - from 35 EUR per cabin per night. English-camping cabins with all the amenities and kitchen, TV. Up to 6-8 persons can stay in one cabin. High season price 70 EUR per cabin per night. Up to 5-6 persons can stay in one cabin. High season price 50 EUR per cabin per night.